You can also monetize your property by using it to generate solar or wind power. “Most people think of wind power as these farms of 50 to 100 turbines,” Lisa Daniels, executive director of the advocacy group Windustry, said. Indeed, if you’re lucky enough to have acres of high, clear, windy land that’s near high-voltage transmission lines, you could earn hundreds of thousands from a wind-power company. But today’s technology also allows for small-scale projects that could power your house and perhaps help supply the neighborhood. 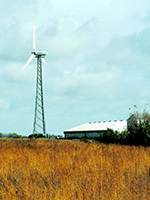 Here’s how: A wind company installs a single turbine on a metal pole, perhaps 100 feet up to clear trees and buildings. You stay connected to the grid and draw power from the utility when you need more than the turbine can supply. But when the wind is up, the mill can power all of your electrical needs—and even pump extra voltage onto the electrical grid, spinning your meter backward, so you get credit for the contribution. With a wind lease from a company such as United Wind, there’s no up-front cost, but you’ll wind up with two monthly electric payments—one greatly reduced bill from the utility, thanks to lower usage, and another from the wind-power company, for what you draw from the turbine, at a below-market-rate price. The bottom line, Daniels says, is about a 10 percent savings, which in a high-electrical-cost area could mean $300 per year.